Sources tell TMZ he feels his former girlfriend Briana Jungwirth isn't being fair with the time he gets to spend with five-month-old Freddie Reign - and he wants to be more present in the young lad's life. He's going to court to seek joint physical and legal custody in the hope of persuading a judge his son should be spending 50 per cent of the time with him. 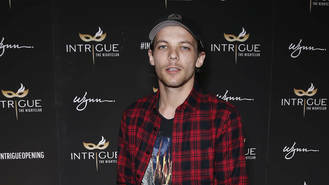 Louis, who is reportedly renting a $1 million (GBP740,000) house for Briana and their son in Calabasas, California, was banned from the pad recently when he went to pick up Freddie with his new love, actress Danielle Campbell. The tot's mum insisted her pop star ex had to pick up his son from family members, reports British newspaper The Sun. A family friend told the publication, "Their relationship has hit rock bottom. He is not welcome at Briana or her family's homes any more. Things are strained." Louis started dating 21-year-old Danielle weeks before Briana gave birth. The new relationship has caused tension between Louis and the mother of his child, and Briana's cousin Ashley Jessica recently revealed the singer's ability to move on so quickly has affected the Jungwirth family. "Yes, it did hurt us. But life is life," she said. "I mean, feelings are feelings and you can't help that. You love who you love - it's just bad timing." Los Angeles-based stylist Jungwirth fell pregnant with her first child after a brief fling with the One Direction star, and they went public with the baby news last summer (15). Briana gave birth to little Freddie in January (16).